The Strange Alchemy Of Fool's Gold On their first album, the L.A. band won over fans and critics with their unique blend of African melodies and Hebrew lyrics. They've changed their approach for their latest album, Leave No Trace. Founding members Luke Top and Lewis Pesacov explain why. 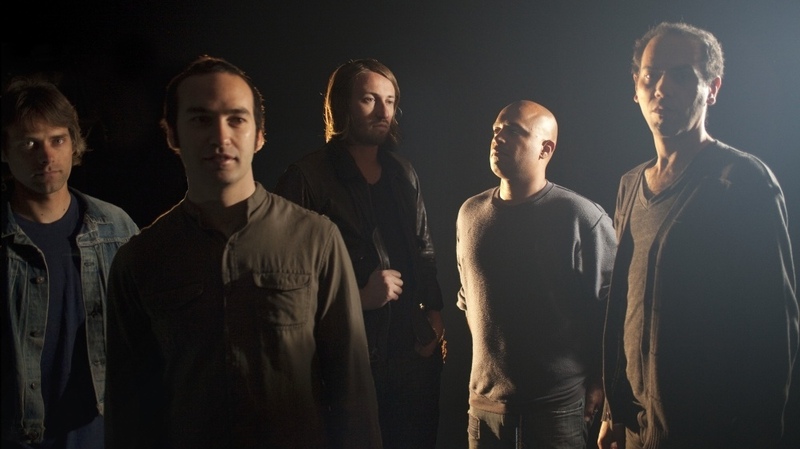 Fool's Gold founding members Luke Top (second from left) and Lewis Pesacov (center) discuss the changes they've made on the band's latest album, Leave No Trace. On its debut album, the L.A. band Fool's Gold presented an unusual marriage of influences, pairing African melodies with Hebrew lyrics. The record won over legions of fans and caught the attention of critics, who described it with words like "beguiling" and "joyous." "I think this record was a process of evolution and articulation, and singing in English seemed like the natural next step," Top says. "I learned to sing by singing in Hebrew, and I wanted to take what I had learned and apply it to my native tongue." Top was born in Israel but moved to the United States when he was young. He says he essentially had to relearn Hebrew to write the lyrics for the first album. Moving from English to Hebrew, then back to English again, continued the complicated sense of identity he'd felt growing up. "I felt like I was in a strange purgatory," Top says. "What is home? What does it mean to be growing up in this country? What does it mean to have a home that's so rich with history and conflict?'" Fool's Gold has recently expanded in other directions, exploring the traditional music of Mali and collaborating with the Tuareg band Tinariwen. Although Top and Pesacov are both from Israel, many of the musical styles that inspire them come from Muslim cultures. "There's something utopian in that through a musical dialogue, we can find a place of peace," says Peascov. "Even though there are political problems in parts of the world where these religions clash, there's a place we can live together in the music. And that's really amazing."